Working with a deep red embroidery thread on a white fabric background justifies a little concern over the washability of the threads. Will the color run, when the Hungarian redwork runner is washed? If it does run, that could be a bit upsetting, don’t you think? So I set about testing my stitch sample, to make sure that I could go forward with the embroidery, using the threads I selected with confidence. This is another reason why stitching a small sample for a project like this comes in handy. With the small sample, I can pretty much do whatever I want to it. The worst thing that could happen? I might ruin the sample. But that’s not really a huge concern! After all, it’s just a sample. My test was pretty simple. When I came back, it looked much the same as ever. I agitated it a bit (quite a bit), and then left it there again. Next time I visited the soaking bowl, nothing had changed. I squeezed the piece up a bit, added more hot water, added a little bit of dish soap for the fun of it, squeezed it up some more, rinsed it, and after a couple hour’s worth of complete water soakage, I finally removed the sample and rolled it up in a towel. Then, I set up my ironing board. Sometimes, threads that don’t run when rinsed in a cool water wash will run in other circumstances, and one of those circumstances is the combination of heat and moisture – steam ironing or ironing while the fabric is damp. I figured I’d try both. Why not? Whenever I iron embroidery, I iron it from the back. The embroidery goes face down on my ironing board, which is covered with two layers of flannel and two layers of white flour sack towels, creating a soft padded area. This padding gives the embroidery something to sink into, so that it isn’t squished during the ironing process. And the white flour sack towels are easy to clean and replace as needed. I’m kind of obsessive about a clean ironing surface. I ironed while the sample was still wet. Then, for kicks, I switched irons. I have two irons. One is always kept dry – no water in it, ever – because I normally iron embroidered linens with a dry iron. Sometimes, especially if water is left in an iron accidentally, the steam burst can discolor a nice, white linen. So I have a separate iron for steaming, and I don’t normally use it directly on my embroidery. But this is a different case. After all, it’s a sample, and I can do anything I want to with it! So, I steamed it. I steamed it slowly, I steamed it in big bursts. Steam, steam, steam – the poor sample was ironed and steamed to death. And the result is what you see in the photo above. And trust me, if the color were going to run, it would’ve done it by now! Moral of the story: I’m good to go. I will use both the DMC perle cotton #8 and the coton a broder #25 (also known as “cutwork thread”) in color 321. Incidentally, this is the “dent” in my soft padding on the ironing board. No color there, either – but that’s not why I’m showing it to you. 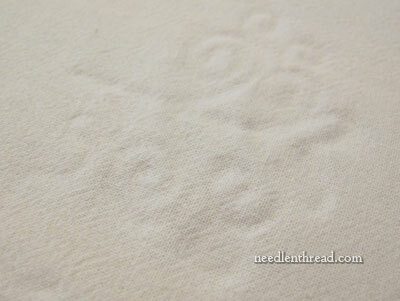 I always love looking at the embroidery dent after I iron something like this. I thought you’d like to see it, too. Another point I learned, which was quite helpful to know with certainty: the transfer method I’m going to use is perfect. 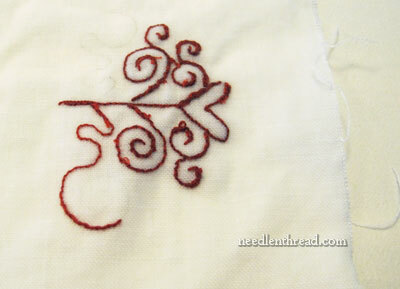 I used it on the right side of the sample, where you can see the unstitched squiggled line quite clearly. It didn’t run, either. And it’s a fine enough line that it can be covered easily with the embroidery, but it’s a dark enough line that it can be seen easily and it won’t rub off. More on that later! Monday, I’ll show you some stitching with this silk gimp we talked about a while ago. 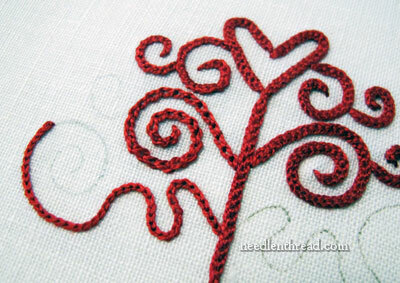 If you’d like to follow along with this Hungarian Redwork Runner project, you can find all articles relating to it, along with patterns and so forth, in the Hungarian Redwork Runner project index. Perfect timing for this article – thank you. 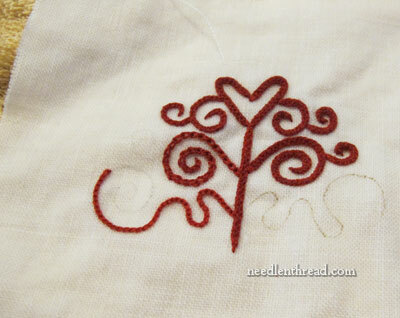 I’m getting ready to embroider something on an apron with red thread! I’ll use DMC perle and not have to worry about color fastness. Hi Mary, this is timely for me. I have a kit that I will stitch next year. It’s a stamped cross stitch baby quilt with some surface stitches as accents. I was thinking about the thread and the colorfastness of it. What would you recommend with that? I am thinking that I will soak all of it before stitching with it. What is the process for this? Ideas — soak individual colors in ?what temp and for how long? What else??? I’d just soak the samples in warm water, or, if you’re planning on the quilt going through the wash, toss the samples in the wash and see how them come out. If you’re using DMC or Anchor, I don’t really think there’s too much to worry about, thought…. Hi Mary – thanks for your comprehensive testing! It has been my observation that red is one of the trickest colors to work with. it either runs, (fabric or thread) or fades or bleeds (red cars,red shutters etc.) Must be something in the chemistry required to create a red. So timely since many of us might be working up Christmas stuff and the predominate color of Christmas is historically red. Very interested in all these posts incl the ones I’ve just missed commenting on. Glad of the dry iron idea. It is a problem and I never thought to have a second iron for dry. I love the ‘ghosting’ patterns too. Some old wallpapers, when the outer layer of paper has lifted, leave a ghosting of the pattern. Patches of original wall in places and parts of the ghosting pattern with smatterings of original paper as well is wonderful. Worth just hanging an empty frame on the wall to highlight part of it. I asked if I could photograph one such wall. The lady was so embarrassed because they hadn’t finished scrapping it all off. She must have thought I was going to report her to the HNA (Homes Neglect Authority) and there was not a doubt at all that she thought I was…you know…a trumpet short of a parade and a sandwich short of the picnic to follow, as well. A handy hint if colours run in embroidery just coat the run in yoghurt and leave it sit for awhile. The yoghurt draws out the colour – then wash as usual. I’m inclined to think that quality threads, (unless hand-dyed and with precautions about washing), don’t run… at least not at 30 degrees… And it’s not recommended to wash embroidery in really hot water… not practical… As is embroidering things that are likely to get so stained that they will require serious washing..! For a bit of fun, next time you do your iron test, grab a piece of rayon velvet and turn up your sample and place the velvet face down on the sample and press. You will now have an embossed velvet. Waiting to read more about the transfer method, Mary. My DMC #8 perle cotton floss did run onto my fabric, just now in fact. I am quite upset. Hi, Sandy – you’ll want to keep rinsing it until the water is clear. Is the thread new? Unfortunately, I found this discussion because I just rinsed a newly finished project in cold water to remove the teenager pen marks, and the 321 bled onto the cream linen cloth. 🙁 I’m hoping that retreating the area with cool water and a little woolite will take it out, but I was surprised and disappointed to see a DMC thread do that. Transfer pen marks, that is. Silly autocorrect. Did the 321 come out of your linen? I hope so! I am just about to start a little Thanksgiving project with DMC 349, and so looked up this topic. Is hungarian embroidery still worth anything if it has significant color bleeding? I have and old piece passed down to me, but the cvolors have bled, so I was wondering if it’s still worth anything and how can I correct the color bleeding problem, if possible? There are laundry products called color catchers available, that help remove or catch “loose” dye – I know Shout is one brand, and I believe Tide makes one, too. They apparently work pretty well – just soak the piece with the color catcher and occasionally change the water until the bled color is diminished or removed entirely. I haven’t tried them myself, but I know several folks in the stitching world who have, to good effect. So might be worth a try! I have been searching for information on ironing a cross stitched item, It was stitched on linen with hand-dyed threads. I’m finishing the project and am having trouble getting the creases out of the stitched area. I’m not sure if the threads are color-fast. Can you give me any suggestions on how I can get this item pressed? Thank you so much! Therese W.